From the rarefied atmosphere of the Swiss Alps to a small London theatre, there has been a lot said about climate change over the last couple of weeks. The World Economic Forum held its annual retreat at Davos, with climate change high on the agenda. Much of the discussion was about building additional momentum towards a UNFCCC led agreement in Paris at the end of this year. Business leaders, politicians and other prominent people from civil society reiterated the need for a strong outcome. World Bank President Jim Yong Kim was more specific and called on leaders to “break out of the small steps of business as usual and provide that structure, first and foremost by putting a price on carbon”. The call for more emphasis on carbon pricing has been a strong World Bank theme for a year now. While there was good talk emanating from Davos, in Brussels the scene was very different. The EU Parliament ITRE Committee (Industry, Research and Energy) was apparently not listening to the calls from Davos and instead ended up with “no opinion” on the important proposals required to support the carbon price delivered by the EU ETS, through the early implementation of the proposed Market Stability Reserve (MSR). The “no opinion” outcome was the result of not supporting the need to start the MSR early and use the 900 million backloaded allowances as a first fill, but then rejecting an alternative proposal on how the MSR should be taken forward. The only silver lining in this otherwise dim cloud is that the debate is about the proposed structure of the MSR, rather than whether an MSR should be present at all. Nevertheless, it is disappointing that some industry and business groups in Brussels did not seem aligned with the recognition that many of their member CEOs were giving to the carbon pricing discussion in Davos just a few hundred miles away. The proposals for the MSR now have to go to the important ENVI (Environment) Committee in Parliament as well as to the Member States, where there is cause for optimism that they will adopt a position in favour of a stronger MSR reform. One business group did give very strong support to the MSR proposals, the UK and EU based Corporate Leaders Group (CLG). This organisation started its life 10 years ago, which means it is also celebrating a landmark birthday along with the EU ETS. The CLG sits under the Cambridge University Institute for Sustainability Leadership, with the Prince of Wales as its patron. This is a group that has been talking about the need for a robust carbon price in the EU for many years and backing that talk up with strong advocacy in Brussels and various Member State capitals. Birthday celebrations were held in London to mark the occasion, with the Prince of Wales in attendance. The CLG was a step ahead of the World Bank with its own Carbon Price Communique back in 2012. While the World Bank effort has garnered greater support than the original CLG effort, it is worthy of recognition that the current push for this important instrument had its roots in the business community. Despite the important talk in Brussels and Davos, the real talk on climate change came from a small theatre in Sloan Square, London. Climate change might seem like an odd subject for the London theatre scene, but nevertheless there it was. 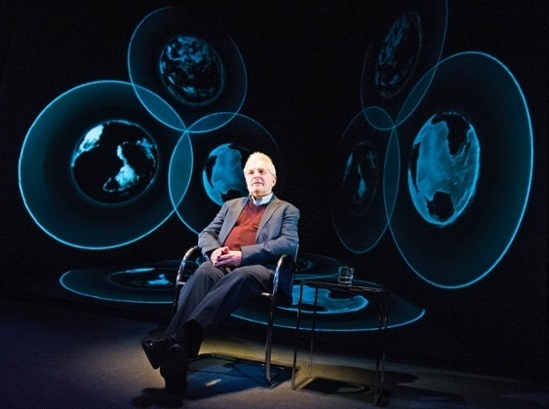 Chris Rapley, former head of the British Antarctic Survey, more recently the head of the Science Museum and now Professor of Climate Science at University College London, staged an engaging one man show to talk about the climate. This wasn’t the Inconvenient Truth with its high profile narrator and 200 odd PowerPoint slides, but more a fireside chat about paleo-history, the atmosphere, trace gases and the global heat balance. Here was a man who had spent the majority of his life studying this issue, from field measurements in Antarctica to computer analysis of satellite observations and his message was very clear; we are in trouble. There was no alarm, no hysteria and no predictions of an apocalypse, but just a softly spoken physicist explaining his job and describing with great clarity what he had learned over the course of some forty years of hard work. The audience was engrossed by the monologue and the gently changing backdrop of graphs and charts that seemed to envelop the speaker. This production is a unique approach to communicating the climate change issue to a new audience. It is small in scale, but it will get people thinking about the subject and hopefully discussing it in less partisan terms. The show, 2071, has now completed a second short run in London but may be destined for some other venues. I would highly recommend it.